There are four Jet mini lathe models currently available, and all four get excellent reviews and ratings. They generate praise again and again for their quiet, smooth operation and solid build quality. The small Jet wood lathes are very popular as a beginner's first lathe, but also for experienced woodturners who have limited shop space, and for those who travel to woodworking shows. Some woodworkers that have full-size lathes also get a mini lathe to use for small projects, and this is one of the most popular brands out there. Jet is a respected name in woodworking tools, and their customer service gets high marks, too. The entry level Jet mini lathe is their model JML-1014I. It has a 10" swing over the bed, with a 7-1/2" swing over the tool rest. The distance between centers is 14", and a bed extension is available that increases the capacity to 40" between centers. It has a 1/2 HP motor with six different pulley speeds, ranging from 500 RPM to 3975 RPM. The Jet JML-1014I features 24-position indexing capability, and a spindle lock for easy removal of chucks and faceplates. The tailstock is hollow with a removable pin in the live center, allowing you to bore a hole through the center of the workpiece. The tailstock is also self-ejecting, with a 2" ram capacity. People on the woodworking forums really like the JML-1014I, too. On the LumberJocks forum, there is a 4-star review, and several people commented that they got into the hobby with this Jet mini wood lathe. It runs quiet and smooth, and has plenty of power for its capacity. The Sawmill Creek forum has a number of happy owners also that highly recommend this Jet mini wood lathe. On the Amazon.com site, the only negative review says that the motor gets uncomfortably hot. This same comment is echoed by several owners on the Sawmill Creek forum, but the heat doesn't really seem to affect the motor's longevity. The only other negative comment (if you can call it that) is that a number of owners wish they had opted for the variable speed model. Which brings us to the next Jet mini lathe model, the JML-1014VSI. The Jet JML-1014VSI has all the same capacities, features and specs as the model above, but with an electronic variable speed control. There are three pulley speeds, and the motor speed is controlled with an external knob, giving you more precise control without having to change the belt position as often. In fact, one magazine review found that they rarely had to move the belt from the middle pulley speed, as the electronic control knob allowed enough speed adjustment for most work. 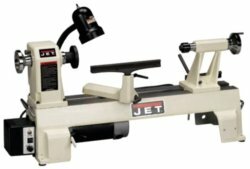 There is a 5-star review on the LumberJocks forum, with three others owners chiming in that the Jet 1014VSI is a great beginner's lathe. Sawmill Creek also has a number of owners that are pleased with the variable speed Jet mini wood lathe. Two different reviewers on the Rockler website say that they have full-sized lathes also, but the Jet mini lathe gets more use than their big ones! People love the variable speed feature, and several owners say they couldn't live without it. Just like the non-variable speed model, owners praise the quiet and smooth operation and say it has plenty of power. There are some complaints though that the JML-1014VSI is not packaged sufficiently for the abuse it gets during shipping. The much-loved speed control box also gets in the way of changing the belt position on the lower pulley. That is the only complaint in a review done by WOOD Magazine. The next step up the Jet mini lathe ladder is the JWL-1220. The Jet JWL-1220 is a little bigger, with a 12" swing over the bed and a 9-3/8" swing over the tool rest. The distance between centers is 20", and a bed extension is available that increases the capacity to 48" between centers. It has a 3/4 HP motor with six different pulley speeds, ranging from 500 RPM to 3900 RPM. The JWL-1220 features indexing capability, and a spindle lock for easy removal of chucks and faceplates. The tailstock is hollow with a removable pin in the live center, allowing you to bore a hole through the center of the workpiece. The tailstock is also self-ejecting, with 2" of ram travel. It comes with both 6" and 10" toolrests, and has a built-in worklight. The Jet 1220 is designed to be portable with retractable carry handles and a cord wrap. The JWL-1220 is praised for its quiet, smooth power and solid build quality. Do we see a pattern here? This Jet mini lathe gets positive comments on the woodworking forums, but there are a few minor complaints. Some owners found the belt access doors awkward, while others said changing belt speeds was quick and easy. There were a few folks on Amazon who had issues with the packaging not being sturdy enough. The most common complaint I found is that the neck on the worklight is not long enough, which was the only complaint in a WOOD Magazine test. Finally, we have the Jet JWL-1220VS, which is essentially the same tool but with variable speed control. Like its little brother the JML-1014VSI, it also has three pulley speeds that are manually changed, and the external control knob allows you to adjust the motor speed. One advantage the variable-speed version has over the regular JWL-1220 model is that it can be dialed down to a slow 200 RPM for working on large diameter stock (500 is the slowest speed on the regular 1220), and also can spin up as high as 4300 RPM. Otherwise, the Jet JWL-1220VS has most of the same features and specs as the JWL-1220, including the extra 10" toolrest and the worklight. Owners love the variable speed feature, and say the Jet mini wood lathe is smooth and quiet. Fine Woodworking Magazine tested the Jet JWL-1220VS in late 2008, and said, "... the 1220VS was a pleasure to use. I turned spindles and bowls with very good results. It ran quiet and smooth, with no noticeable vibration. And it had plenty of power throughout the entire speed range, with no drop-off in torque at the lower speeds." My father just purchased this model in 2012, and he agrees. It runs much smoother and more quietly than the no-name lathe he used on and off for forty years to turn out some really fine pieces! There are very few complaints for this Jet mini lathe. As with the non-variable speed version, the neck on the lamp is too short. A couple of owners have had to get replacement switches (covered under warranty), and on some examples the latch doesn't hold the speed control box in place very well, and it will occasionally swing open during use. Note: Jet recently added a new model to their lineup, the JWL-1221VS. It has a 12-1/2" swing and 20-1/2" capacity between centers. The 1 HP motor is reversible, and it offers speeds from 60 RPM to 3600 RPM. There aren't many owner reviews out on it yet, but you can read more about it at Amazon . The variable speed Jet lathes are definitely the way to go if you can afford the extra cost. When it's all said and done, one comment I saw repeatedly on the woodworking forums is that you can't go wrong with a Jet mini lathe. However, if you are considering the Jet JWL-1220 or JWL-1220VS, you owe it to yourself to take a look at the Delta Wood Lathe models also. If you need a little more capacity than the Jet mini lathe can provide, you might want to look at the mid-size Jet wood lathes. You can get all the detailed specs for the various Jet wood lathe models at JETTools.com. Overall, the Jet mini lathes are great performers. In the reviews, it is brought up over and over again how quiet and smooth the Jet wood lathes are. Very few owners have had issues with reliability or quality, and those that did commented that Jet's customer support was terrific. Each of the Jet mini lathe models also come with a 5-year warranty. Current owners repeatedly recommend them on the forums when someone asks, "What mini lathe should I buy?" By the way, if you are new to woodturning or a veteran that is interested in getting more out of your lathe, there are tons of great woodturning books out there. The ones that seem to be recommended most often for beginners on the woodturning forums are Turning Wood with Richard Raffan and The Lathe Book: A Complete Guide to the Machine and Its Accessories by Ernie Conover. I would recommend either of these books as an introduction to woodturning - I have an older edition of "Turning Wood With Richard Raffan" and it has been a great resource for me as a beginning woodturner.